CAIRO, Egypt -- The inauguration of President Abdul Fattah al-Sisi on Sunday, 8 June, was a cause for celebration and excitement throughout much of Egypt. But hours after the commencement of al-Sisi's presidency, the festivities turned violent. Several women were sexually assaulted and battered in Tahrir Square in downtown Cairo. Since Sunday, nine men have been arrested in connection to the string of assaults. The mob targeted at least five women, surrounding and sexually assaulting them. The torture proved extremely serious; four of the women were transported to the hospital after the vicious attacks. The violent crowd of men surrounded a range of women, including one pregnant Egyptian, and a mother who had been enjoying the Tahrir Square scene with her daughter before the mob encircled and violated her. The criminals moved through the square with relative impunity, stripping one woman completely naked and lacerating her. The attack went on far too long before police were able to separate her from the mob. According to reports, the security officers threatened to discharge their weapons, but no shots were fired. Today, 11 June, women responded to the series of attacks that followed Sunday's inauguration, gathering in Tahrir Square as a statement of solidarity and resilience. Sexual assault has become commonplace in Tahrir Square, especially during the massive protests in 2011 and 2013 that saw President Mubarak and President Morsi removed from office. Women who demonstrated during this pivotal political time were often silenced through sexual assault, which at the time was not a punishable crime in Egypt. A study published by the United Nations finds that 9 out of 10 Egyptian women have been sexually harassed, sexually assaulted or raped. Thursday of last week, 5 June, new legislation was implemented by the provisional government to protect women from sexual assault, and hold perpetrators responsible for the first time in Egyptian history. Advocates of the measure hope that it will curtail the growing problem. 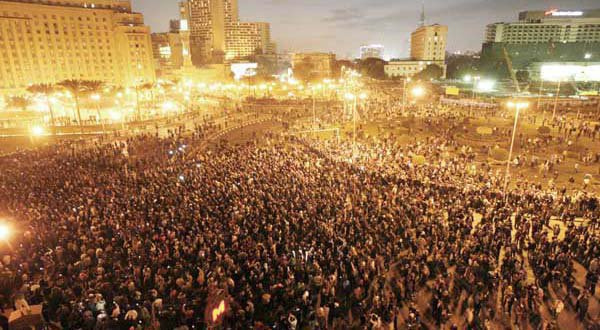 Tahrir Square has become very much a symbol of Egyptian liberty and self-determination, as men and women took to Tahrir Square during instrumental demonstrations in 2011 and 2013, to speak out against governments that did not represent their best interest. It is my hope that the continuing protests, aimed at promoting gender equality and safeguards for Egypt's women, will be as revolutionary as the demonstrations for political reform in 2011 and 2013.